Edgelands are not necessarily always on the urban edge. Not physically anyway – the important thing is they are perceived as different from the zones that lay beyond. 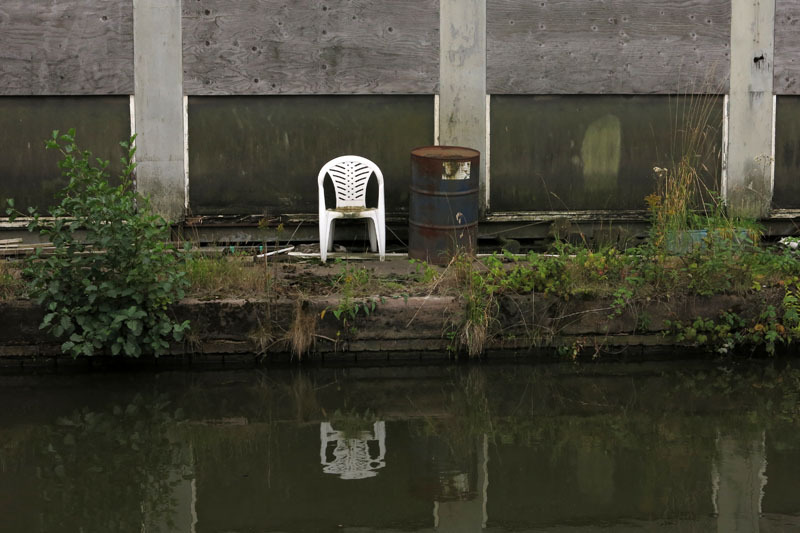 Neither strictly urban nor rural but an overlooked amalgam of the two in a cannot-make-up-its-mind frontier zone, canals constitute an edgeland of sorts – a conduit by which the countryside without can snake its way into and through a town or city. 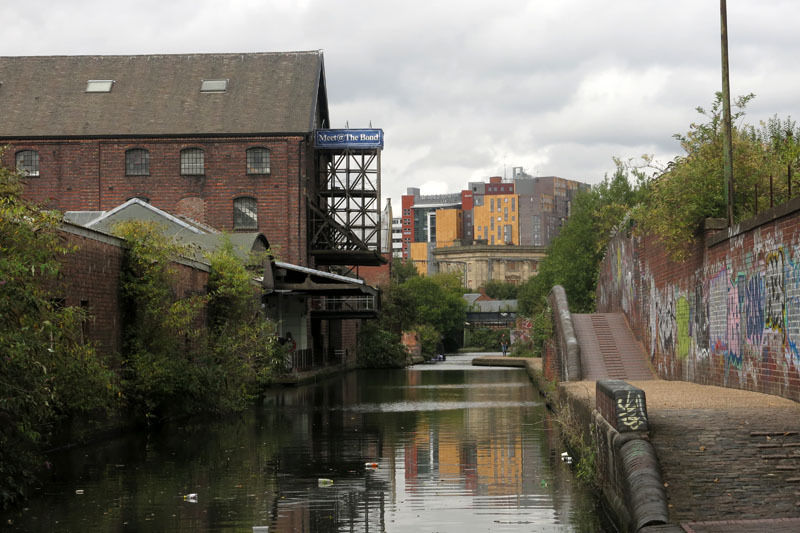 A narrow green thread of water and wildlife through concrete and brick, their resilience is remarkable, and canals can withstand pretty well anything that their urban surroundings may throw at them. 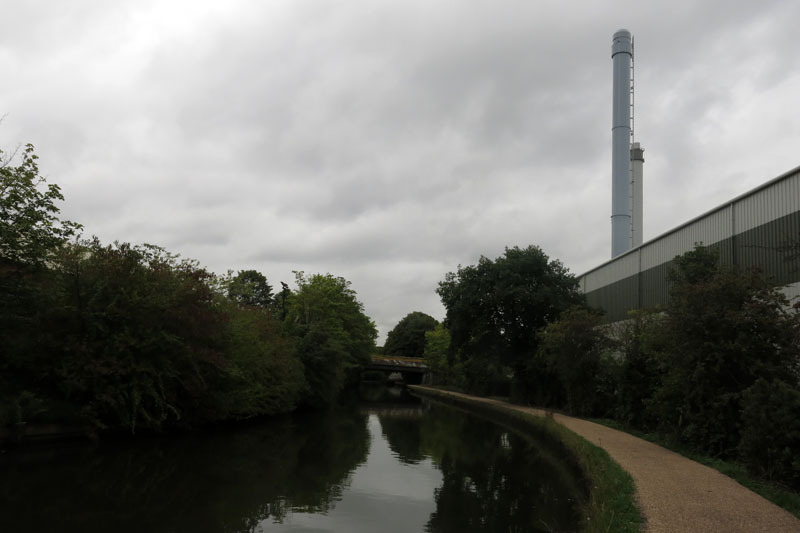 In the early decades of the 19th century canals dramatically changed the face of the landscape as countless navvies laboured to gouge channels through the countryside to create a network of slow-moving waterways between the towns and cities of newly industrialised Britain. With the coming of the railways just a few decades later most of these were soon reduced to the status of transportational white elephants, although their sluggish water would always be valuable for industrial cooling and quenching purposes as well as providing a handy receptacle for dumping factory effluent. These days nearly all canals have been re-imagined for leisure purposes – narrow boat holidays, fishing, cycling and walking. 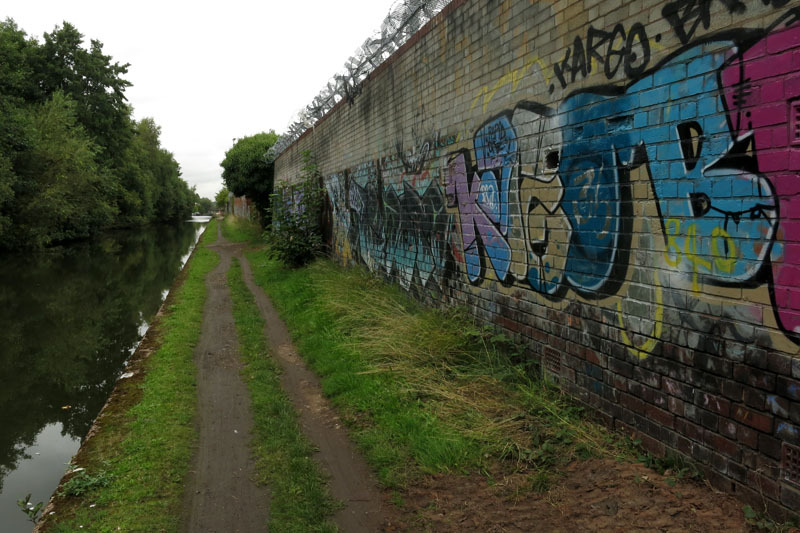 Nevertheless many, like the Grand Union Canal that curves its way into central Birmingham from Oxford and the south, seem to have few users despite a well-maintained towpath. It was this canal that I chose for my approach to the city centre having sneaked in under the thrumming M6 at Chelmsley Wood close to its airport (see Birmingham Edgelands Part 1). Perhaps it was the less than endearing urban surroundings that was keeping visitors away? Thanks to high-budget projects, like the curvaceous, disc-clad Selfridges building and the newly redeveloped New Street Station, Birmingham might well be currently enjoying a minor renaissance but drabber inner-city areas like Sparkhill and Small Heath rarely make the Sunday papers’ “see-before-you-die” travel sections. 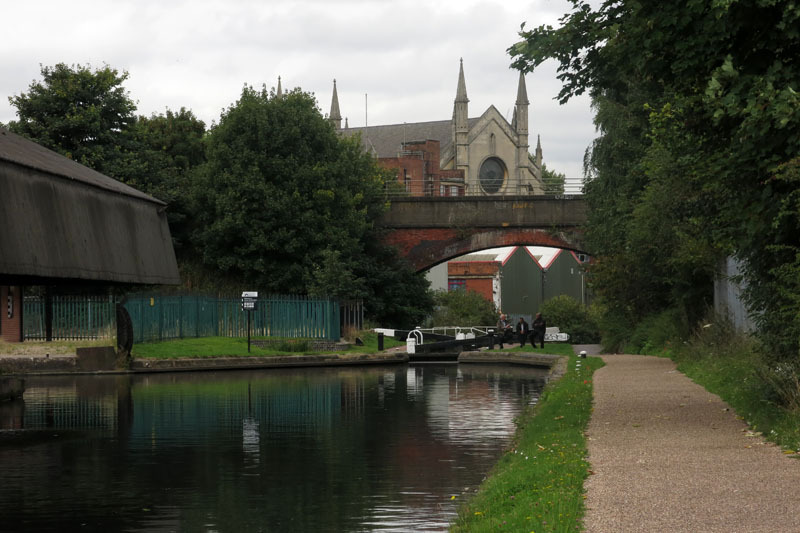 Consequently, I had the canal almost to myself as I followed its towpath westwards and inwards from Olton in the east of the city. It was only close to gentrified Gas Street Basin that I started to have much in the way of company. There was the odd cyclist along the way of course, an optimistic fisherman here and there, and even the occasional lone spliff-smoking youth wasting the morning away on a waterside bench, but for the most part I was oddly alone – the local graffiti artists (there was no shortage of evidence of their presence) had long since completed their mission and taken their spray-cans to scent-mark pastures new. 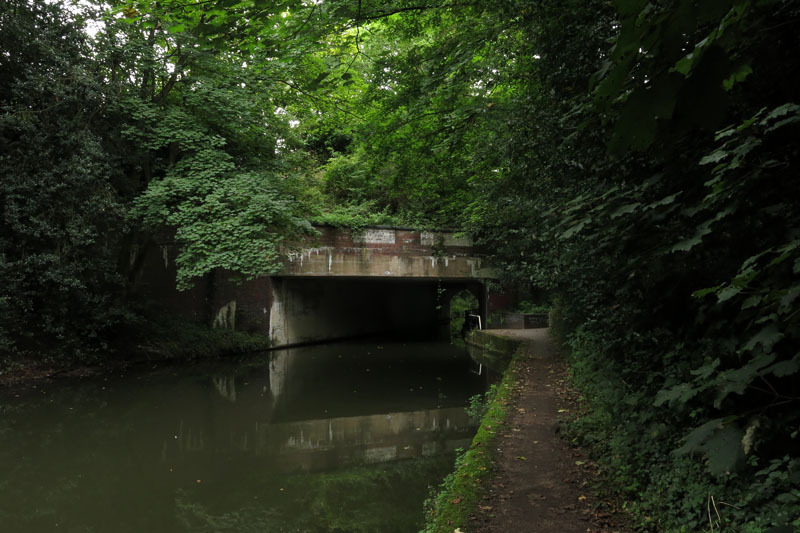 At Olton the canal is a rural microcosm, its bosky banks bursting with leaf and life as it winds its way further into the city’s heart from Acocks Green to Yardley. 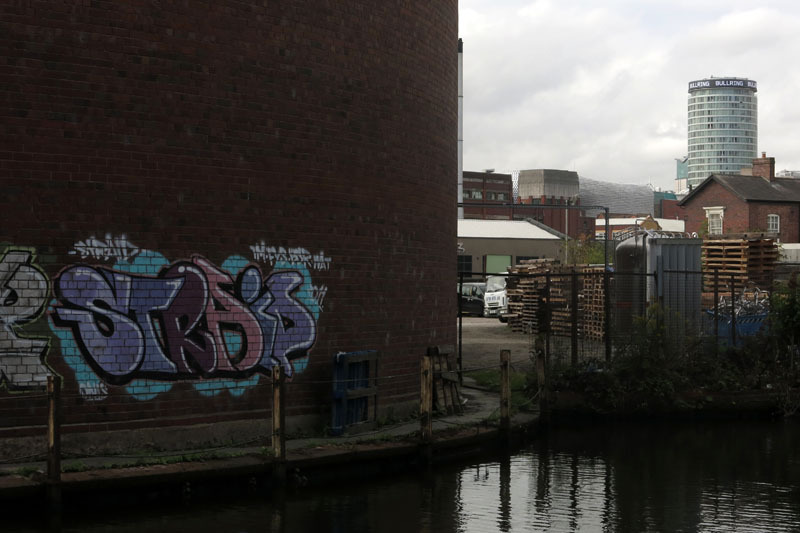 But closer to the centre the vestiges of industry draw closer to the water itself – high factory walls and railway sidings at Small Heath, Victorian warehouses at Sparkhill, railway bridges and flyovers at Bordesley. Everywhere graffiti, the heraldry of hyperactive taggers, and ciphers of Birmingham’s tribes – Blues and Villa, West Brom, even a lone, provocative Wolves flag curtaining a cracked factory window. 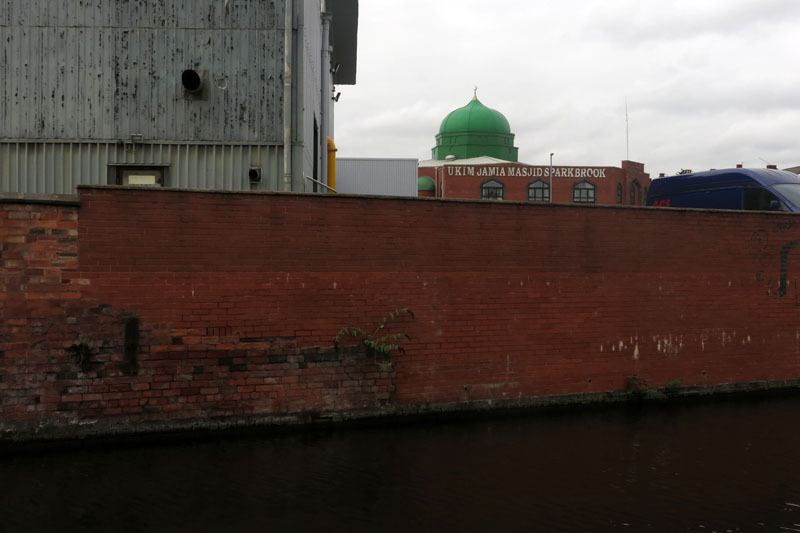 Occasional gaps in the buildings and solid walls offer rare glimpses of the world beyond – a large mosque at Sparkhill, new offices and residential blocks at Aston – but the city’s more iconic high-rise buildings are surprisingly elusive until the centre itself is reached. 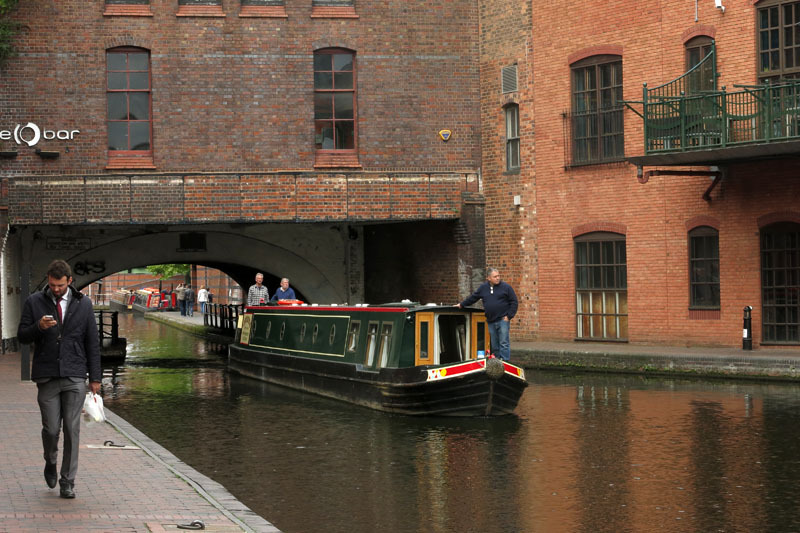 Eventually, somewhere near Nechells Green, the canal turns a tight loop south for its final run into Gas Street Basin. Here at last are barges on the water, joggers and lunchtime office workers on the towpath, modern new apartments over the water and waterside pubs with outside tables. Finally, this is a place that people choose to be – a respite from city-centre bustle and rattling traffic. 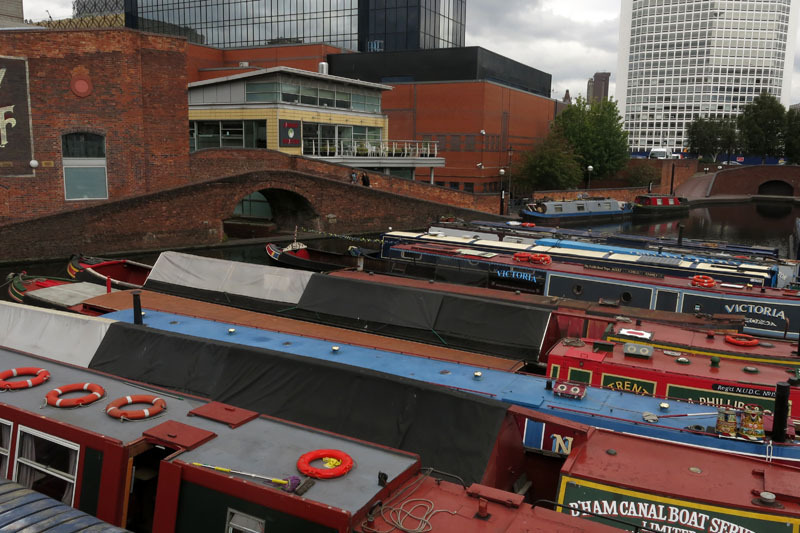 Here you can lose sight of the fact that, despite the oft-repeated claim of having more canals than Venice, modern Birmingham is largely a city where the pedestrian is peasant and the motorcar is king. A case of unconscious onomatopoeia, it’s not called Brum for nothing. 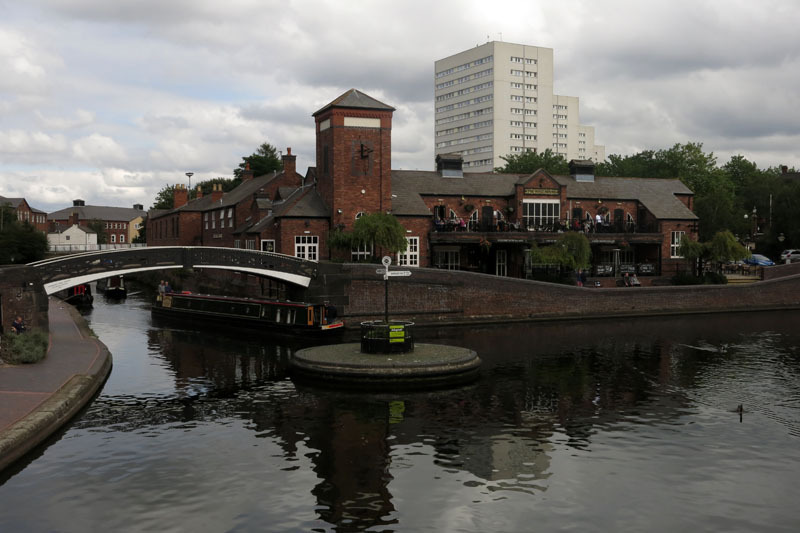 This entry was posted in History, Human Geography, Midlands and tagged Birmingham, canals, psychogeography, urban, walking. Bookmark the permalink. 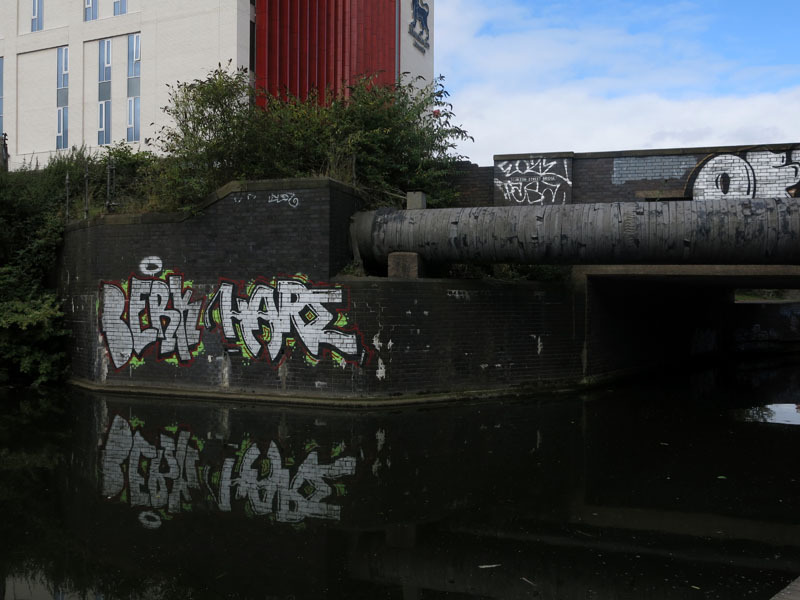 This year I have travelled by train through Wolverhampton and Birmingham several times and the views of canals, abandoned buildings and crumbling bridges always looked fascinating for urban explorers, pyschogeographers, edgelands connoisseurs – whatever label you want to apply! I wondered why to the best of my limited knowledge no-one had written about these margins. Great post and it sounds as interesting a place to explore as I thought it would be. Thanks Alex. 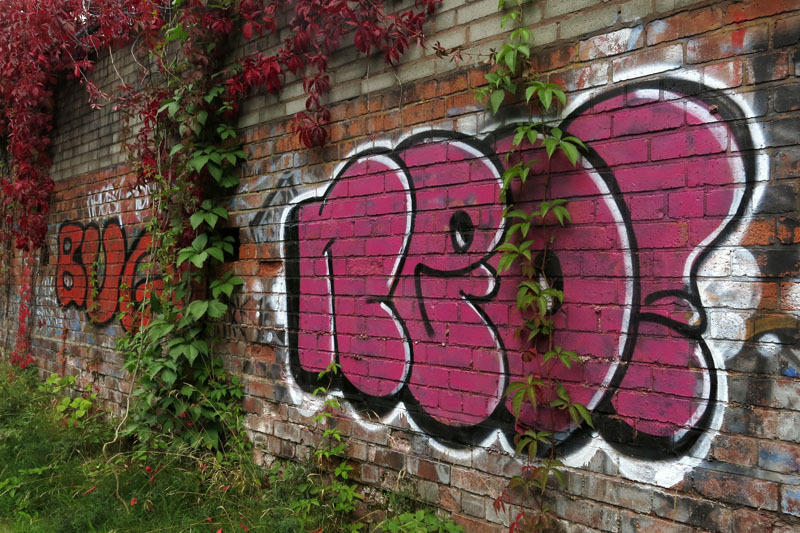 No doubt it the whole of the West Midlands is a region ripe for extensive urban exploration. There’s so much industrial and social history here and, despite re-imagining of the city centre, there’s no shortage of decay either. Like Glasgow, its mostly Victorian, although much of Birmingham is unashamedly 1970s concrete too. PS – enjoyed part 1 as well but at time too busy to comment at time with work event…in ICC, Birmingham. Sadly no time to wander further then the Gas Street Basin! Very frustrating. Frustrating, yes. At least you can have a look at the new library.